We manufacture and offer Fully Automatic Cap Sealing Machine that are suitable for industries like Food and Beverages, Chemicals, Pharmaceuticals Cosmetic etc. We are manufacturing and exporting a wide range of Automatic ROPP Cap Sealing Machine. 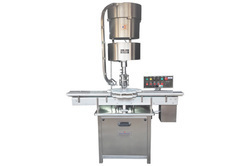 We offer ropp cap sealing machine. 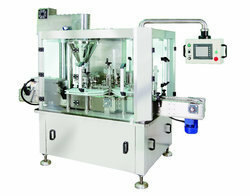 ropp cap sealing machine is use in pharmaceutical industries. 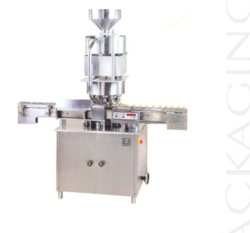 ropp cap sealing machine is use for pet and glass bottle cap sealing. Suitable for Industries like Food and Beverages, Chemicals, Pharmaceuticals, Cosmetic etc. Unique single sealing roller imparts uniform, scratch free, fit tight and reliable skirting and sealing. Machine Stops while vial overturned, jamming or overloading. We offer Automatic Cap Sealing Machine.Its speed is 40 bottle per minute. This is a linear machine. Looking for Cap Sealing Machine ?